Visits to the IRS website are up by more than 10 percent this year, indicating that the new tax code confused a lot of people, said one tax expert. With less than a week to go before the tax filing deadline on April 15, more Americans seem to be dragging their feet — and evidence suggests this procrastination is due to the significant changes many are facing this year under the 2017 Tax Cuts and Jobs Act. According to data from the Internal Revenue Service, the number of returns filed as of the last Friday in March was down by nearly 1.3 million, or 1.4 percent, compared to last year. “I think taxpayers are still kind of scratching their heads about it. Despite all the articles and news and caveats and warnings about withholding, it’s only during tax season that… they think about it,” said Gil Charney, director of the Tax Institute at H&R Block. Howard Gleckman, a senior fellow in the Urban-Brookings Tax Policy Center, also suggested that a knowledge gap among taxpayers could be a factor. “People are a little slower filing than they were last year. That doesn’t surprise me, because the laws are new and there’s been so much confusion about it,” he said. “The other bit of evidence that suggested people were confused was all those visits to IRS.gov,” Gleckman added. “That basically says people had to learn a lot.” IRS statistics found that visits to the agency’s site were up by more than 10 percent this year. Another reason could be a lack of motivation: According to a new NBC News/Wall Street Journal Poll, only 17 percent of taxpayers think their 2018 tax burden went down, while 28 percent expect to pay more and the same number told pollsters they didn’t know enough to say either way. The degree of optimism largely fell along party lines, but even Republican respondents were lukewarm in their sentiment, with only one-third telling pollsters they expected a tax cut. Just 7 percent of Democratic-identified respondents said the same. In reality, the nonpartisan Tax Policy Center estimated that about 80 percent of filers paid less in taxes in 2018, but two factors are obscuring that. For one thing, the cut might have been too small to notice. A Tax Policy Center analysis found that taxpayers earning less than $25,000 annually got an average tax cut of $60. Those earning roughly between $49,000 and $86,000 got a tax break of around $900. In addition, due to changes in IRS withholding tables, that benefit may have been spread out in a worker’s paycheck through the course of the year — leaving some people with a smaller refund or none at all. But the IRS data also showed that the number of refunds it has issued so far this year is down by 2.2 percent — a figure that could fall further, since earlier-filing taxpayers tend to be the ones who are expecting a refund and are eager to receive it. “If someone knows they’re getting a refund, more likely than not they’re going to want to file as soon as possible,” said said Harvey Bezozi, tax expert and founder of Your Financial Wizard. Charney also suggested the lower number of refunds could be indicative of a rise in taxpayers filing for extensions because they — or their preparers — needed more time to incorporate the TCJA’s many changes and make their calculations. If this is the case, it will take longer for analysts to assess the complete impact of the law’s impact on the American taxpayer. The I.R.S. data hints that a sort of bifurcation could be taking place. For taxpayers with already-simple returns, filing got even easier. 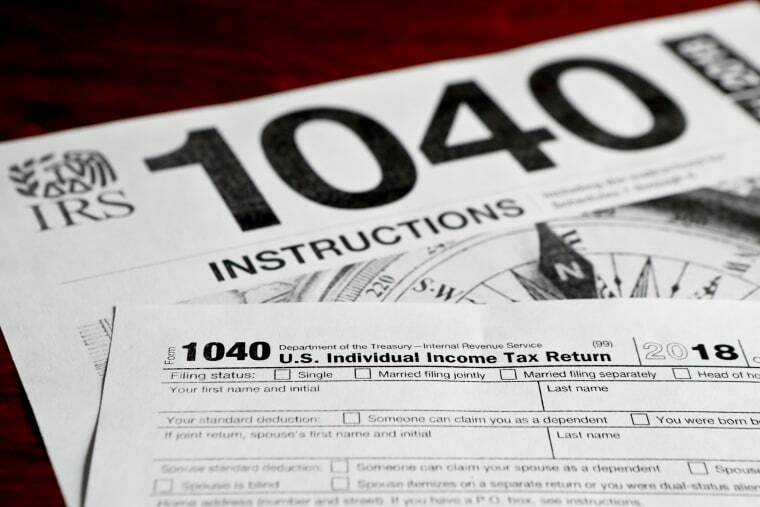 The number of people who filed self-prepared returns rose by 2.3 percent from last year, while the number of returns submitted by a professional tax preparer dropped by 2 percent. Proponents of the TCJA promised that, for many wage earners, filing taxes would be simpler because the higher standard deduction — and elimination of a host of deductions and exemptions — would prompt fewer people to file itemized returns. “I suspect that’s right, [since] more people are able to take the standard deduction so it’s actually simpler,” Gleckman told NBC News. But for people with more complex returns — business owners and partners, contractors, or investors — an already byzantine tax code became even more complex. “Professionals may be so confused about it that they’re not getting around to file their clients’ returns because they’re overly inundated,” Bezozi said. “It may also be that the tax professionals are backed up,” Gleckman said. “The paid preparers may be behind a bit.” He theorized that a heavier workload for accountants was exacerbated by the partial government shutdown that delayed the issuance of critical tax-season guidance from the IRS.